The concept of yogurt in an instant is simply a new idea on an old favorite. The dawn of new technologies now allows the gentle drying of yogurt into a powdered form which when water is added instantly produces yogurt. This new form of yogurt “on-the-go” is changing the face of yogurt consumption everywhere now, where you eat your yogurt is totally up to you! Each Yo-Quick! pouch is small enough to easily tuck in a suitcase, backpack, saddlebag, or briefcase, and will make one 6 oz. serving of yogurt in less than 30 seconds. Yo-Quick! comes in three tasty flavors; Blueberry Blast, Sensational Strawberry, and Very Vanilla. Fill to mark with water and reseal. Powered by Ganeden BC30 Probiotic! Part of the genius behind Yo-Quick! is the probiotic health that each packet offers. 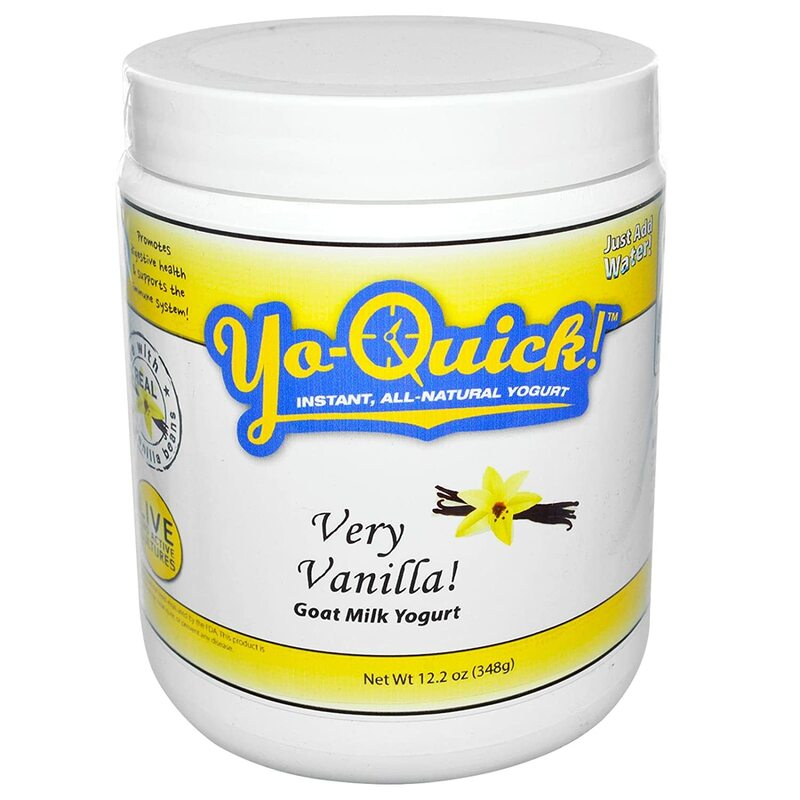 Yo-Quick contains naturally occurring probiotics as well as the patented GanedenBC30. This is the trademarked name for the patented strain of probiotic bacteria, Bacillus coagulans GBI-30, 6086. GanedenBC30 is not a drug. It is a natural supplement that can help support your digestive health and maintain your immune system. Each Yo-Quick! packet come brimming with these friendly probiotics. 6 Things to Know about Yo-Quick. Goat Milk: Goat milk is easier to digest and for that your stomach will thank you. All Natural: No pesky additives, preservatives or artificial ingredients found here. Probiotics: Friendly bacteria get a free ride in every packet of Yo-Quick! Gently Processed: Low temperatures during creation always keeps yogurt happy. Convenience: The five ways (listed above) to enjoy Yo-Quick! are truly only the beginning. Delicious: When a yogurt tastes this good you’ll be certainly wanting more. The ‘Problem’ of Traditional Yogurt. Due to the perishable nature of yogurt it is imperative that it be constantly refrigerated to avoid spoiling. Not only this but traditional yogurt containers will often break open and ooze out a mess if placed in a backpack, briefcase or similar travel accessories. Therefore, those who enjoy the taste and health benefits of yogurt often have to limit their consumption to the confines of their own home or office. Yo-Quick! solves this dilemma by letting you choose when and where to eat your yogurt. Yo-Quick puts you back in control! Yogurt in its many varieties has been a favorite food for millennia. In all likelihood it dates to the beginning of the domestication of cattle. Yogurt helped nourish the armies of Genghis Khan in the 13th Century. This healthful and delicious product has long been a staple in the Middle East, Asia, Russia and Eastern Europe. Many credit regular consumption of yogurt with prolonging lives. The lactose (milk sugar) in milk is consumed by lactic acid producing bacteria which gives yogurt a thick consistency as well as delicious tangy flavor. These “friendly” bacteria are also known as probiotics and they are a major reason that yogurt is such a healthy food to consume. In fact, in 1905, Russian Nobel laureate biologist Ilya Mechnikov hypothesized that the incredibly long lifespan of the Bulgarians at that time was due to their frequent consumption of yogurt. The Wonders of Goat Milk Yogurt. Few things are as nutritionally rich as goat milk yogurt. Abundant in protein and calcium, goat milk yogurt has a host of health benefits. It has been used to treat and prevent antibiotic-associated diarrhea as well as to promote gum health. Goat milk has excellent digestibility and this benefit is even more profound when goat milk is consumed in the form of yogurt. Even those with the most sensitive stomachs can often tolerate goat milk yogurt. Yogurt is an incredible food that each of us should be readily consuming on a regular basis. Yo-Quick is your solution for any situation. *Always consult your medical doctor before taking any new food recommendation, particular type of food, or supplement, any information whatsoever, or any mental or emotional concept at all, whether recommended in A Course in Life or not. It is highly recommended that you seek the guidance of your medical doctor before implementing any change in your diet, or incorporating or taking any of the above mentioned. Under no circumstances should any person under 18 ever put into practice any part of A Course in Life whatsoever without strict guidance of a medical doctor. If pregnant DO NOT do anything in A Course in Life without the guidance of your doctor. If sick in any way, do not do any part of A Course in Life with guidance of your doctor. Do not recommend any part of A Course in Life without guidance of a medical doctor. In fact, EVERYONE should seek the guidance of a medical doctor before doing ANY part of A Course n Life. Any and all parts of A Course in Life are not to be construed as prescriptive in nature, nor should such ever be construed as replacement for medical advice, medical care, or medically prescribed drugs or protocols. It is to be understood that in no way does A Course in Life, any written or oral statement whatever herein and therein, make(s) any claim of the ability to heal anything in any way. *All of the statements above have not been evaluated by the FDA. Any mentioned product(s) food(s) or supplement(s), are not a medicine(s). Any product, food recommendation, or anything else stated in any way, are not intended to diagnose, treat, cure, or prevent any disease-physical or mental. We make no curative claims whatsoever, nor any ability to heal anything whatsoever.